Home » Health A-Z • Live Well » Is It Angina, Heartburn Or Heart Attack? Know The Difference! 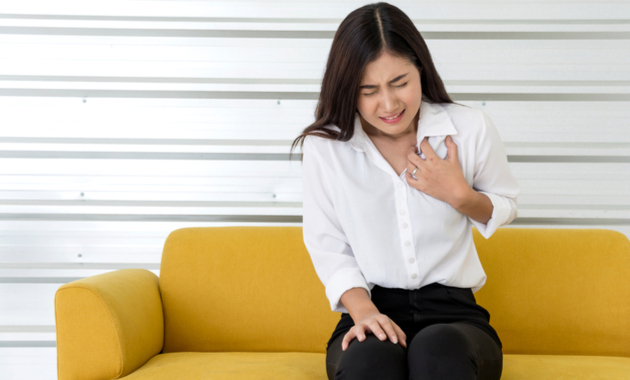 Is It Angina, Heartburn Or Heart Attack? Know The Difference! A chest pain is often confused with a heartburn or a heart attack but all these terms are technically different. People who have a heart attack or those who experience heartburn do complain about pain or discomfort in the chest. Does every chest pain is a sign of a heart attack? How to distinguish between heartburn and heart attack? When should you go to a doctor if you have a chest pain? What is angina?. Well, all these questions are answered by explaining in detail about the key differences between angina, heartburn and heart attack. Angina, Heartburn, And Heart Attack: How Is It Different? Angina: According to the American Heart Association, angina is pain or discomfort in the chest which is usually due to a heart disease. In most cases, chest pain could be due to a buildup of plaque (fatty substance) which partially or completely blocks the blood flow to some areas of the heart (depending upon which vessel has been affected). This may lead to pressure or squeezing sensation in your chest. It might feel like a heart attack but is often a warning sign of a heart attack. -Stable angina which is usually triggered by a physical activity or stress. It usually lasts for few minutes and subsides when you rest. It might not be a heart attack but can be a sign that you are likely to get a heart attack. -Unstable angina can happen even when you are at rest or not physically active. The chest pain might be strong, long-lasting and repetitive. It can be a sign that you are about to have a heart attack. So consult a doctor right away. -Variant angina is a rare symptom that can happen when you are asleep. The arteries become narrow suddenly leading to severe pain. This should be treated immediately. Always Trust For Better Heart Care. Check Our Store Now! Heart attack: A heart attack happens when there is a sudden and complete or partial blockage of the artery that supplies blood to the heart. Mostly, coronary artery disease is the underlying cause of a heart attack. It is a condition in which the coronary artery (the blood vessel that supplies blood to the heart) is blocked. The longer the blockage is left untreated, the more is the damage to the heart muscle. If the blood flow is not restored on time, it can lead to permanent damage of the heart muscle. Most people don’t know they have heart disease until they have chest pain (angina) or a heart attack. If you or anyone experience a chest pain/discomfort or other symptoms of a heart attack rush to a hospital immediately. Consult a doctor even if you feel a mild pain or discomfort in the chest as it might indicate that your heart is in trouble and need help. -A bitter taste in the mouth or pain which worsens when you lie down. Angina, Heartburn And Heart Attack: When To Go To A Doctor? Most often than not, people tend to ignore any pain or discomfort in the chest thinking it could be due to acidity or a heartburn but it could be a subtle sign of a heart attack. If you feel pain in the left arm or upper part of the jaw which is accompanied by sweating, then it could be a sign of a heart attack. In such a case, rush to a hospital immediately. -Cardiomyopathy which is a condition that causes enlargement of the heart. -Aortic stenosis which occurs due to the narrowing of the aortic valve (a part of the major blood vessel of the heart). -Aortic dissection is when the wall of the aorta is ripped off which puts pressure on the heart. -Pulmonary embolism that causes a blockage in the arteries of the lungs. Hence, it is advised that if you have any pain or discomfort in the chest, it is wise to consult a doctor immediately as it might be difficult for a common man to know the key differences between a heartburn, angina and heart attack. Your doctor will ask you a few questions and order a few tests to find out the exact cause and treat the condition accordingly to prevent a heart attack (if any). Check These Warning Signs Of Heart Attack In Women!! Did You Know How Ice Is So Good For Your Skin? 8 Effective Tips To Get You Glowing After Holi! ← What Are The Main Causes Of Colorectal Cancer?